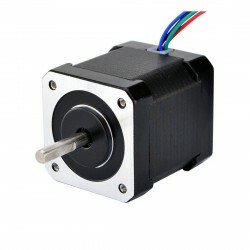 Home » Stepper Article » Stepper FAQ » How to Choose a Stepper motor Suitable for You? 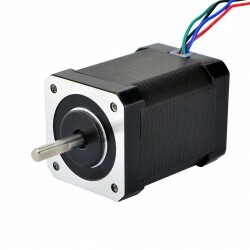 How to Choose a Stepper motor Suitable for You? • How will the motor be coupled to the load? • How fast does the load need to move or accelerate? • How much torque is required to move the load? • What degree of accuracy is required when positioning the load? 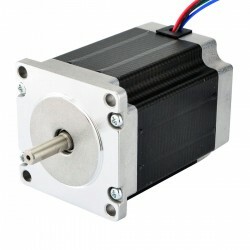 Usually Stepper motors have two phases, but three- and five-phase motors also exist. A bipolar motor with two phases has one winding/phase, and a unipolar motor has one winding with a center tap per phase. 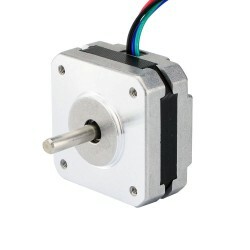 Sometimes the Stepper motor is referred to as a “four-phase motor”, even though it only has two phases. The motors that have two separate windings per phase can be driven in either bipolar or unipolar mode. A pole can be defined as one of the regions in a magnetized body where the magnetic flux density is concentrated. Both the rotor and the stator of a step motor have poles. 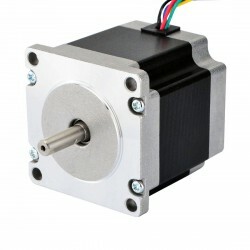 The hybrid type Stepper motor has a rotor with teeth. The rotor is split into two parts, separated by a permanent magnet-making half of the teeth south poles and half north poles. The number of pole pairs is equal to the number of teeth on one of the rotor halves. The stator of a hybrid motor also has teeth to build up a higher number of equivalent poles (smaller pole pitch, number of equivalent poles = 360/teeth pitch) compared to the main poles, on which the winding coils are wound. Usually 4 main poles are used for 3.6° hybrids and 8 for 1.8° and 0.9° types. The following equation shows the relationship between the number of rotor poles, the equivalent stator poles, the number of phases and the full-step angle of a Stepper motor. If the rotor and stator tooth pitch is unequal, a more-complicated relationship exists. 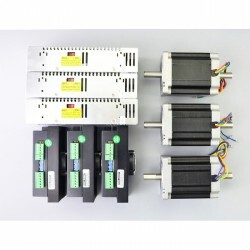 In addition to being classified by their step angle, Stepper motors are also classified according to frame sizes which correspond to the frame size of the motor. 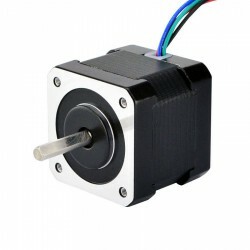 For instance, a size 11 Stepper motor has a frame size of approximately 1.1 inches. 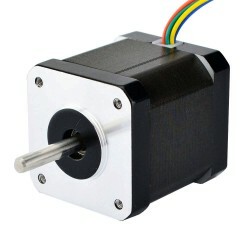 Likewise a size 23 Stepper motor has a frame size of 2.3 inches (57 mm), and etc. However, the body length may vary from motor to motor within the same frame size classification. Generally speaking, the available torque of a particular frame size motor will increase with increased body length. 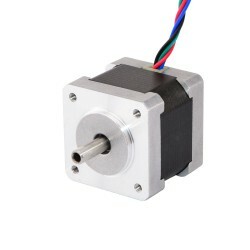 The output torque and power from a Stepper motor are functions of the motor size, motor heat sinking, working duty cycle, motor winding, and the type of driver used. 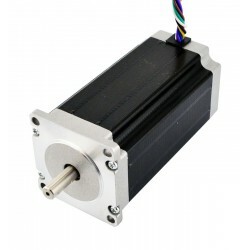 If a stepper motor is operated no load over the entire frequency range, one or more natural oscillating resonance points may be detected, either audibly or by vibration sensors. For the usable torque from the Stepper motor can be drastically reduced by resonances, operations at resonance frequencies should be avoided. External damping, added inertia, or a microstepping drive can be used to reduce the effect of resonance. In a Stepper motor, the torque is generated when the magnetic fluxes of the rotor and stator are displaced from each other. The magnetic flux intensity and consequently the torque are proportional to the number of winding turns and the current and inversely proportional to the length of the magnetic flux path. As rotation speed increases, the time taken for the current to rise becomes a significant proportion of the interval between step pulses. This reduces the average current level, so the torque will fall off at higher speed. 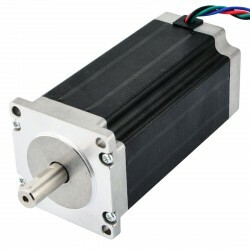 The resolution and positioning accuracy of a Stepper motor system is affected by several factors－the stepping angle (the Stepper motor full-step length), the selected driver mode (full-step, half-step or microstepping), and the gear rate. This means that there are several different combinations which can be used to get the desired resolution. 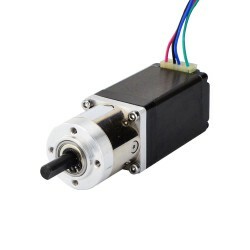 Because of this, the resolution problem of a stepping design can normally be dealt with after the motor size and driver type have been established. Determine the mechanism and required specifications. First, determine certain features of the design, such as mechanism, rough dimensions, distances moved, and positioning period. 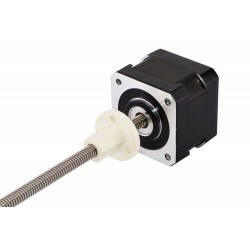 Find the resolution the motor requires. 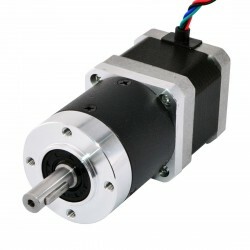 From the required resolution, determine whether a motor only or a geared motor is to be used. 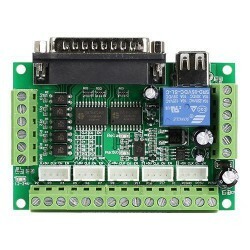 However, by using the microstepping technology, meeting the required resolution becomes very easy. Determine the operating pattern that fulfills the required specifications. Find the acceleration (deceleration) period and operating pulse speed in order to calculate the acceleration torque. Calculate the load torque and acceleration torque and find the required torque demanded by the motor. Make a provisional selection of a motor based on required torque. Determine the motor to be used from the speed-torque characteristics. Confirm the acceleration/deceleration rate and inertia ratio.